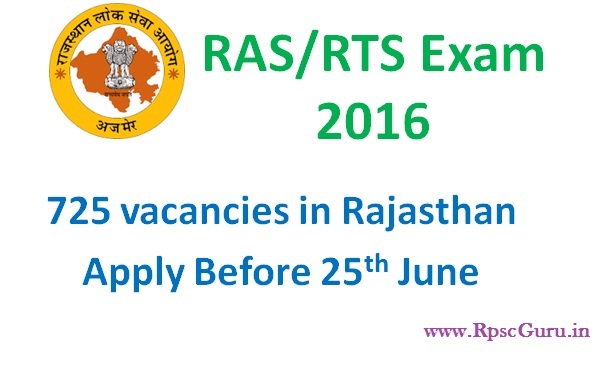 Dear Readers we are very happy to inform you that Rajasthan Public Commission has Released RAS Exam 2016 Notification and RAS online Application Form 2016 is releasing on 10th May 2016 to 25th June 2016 for the recruitment of 725 vacancies in Rajasthan Administrative Services. RPSC RAS Pre Exam 2016 will be held on 28th of August 2016, while main exam will be held in October – November 2016. RPSC RAS 2016 Apply online link will be available at rpsconline.rajasthan.gov.in. Official Notification release date: 28th April 2016. Online Registration Start from: 10th May 2016. Last date for submission of application fee at E-Mitra Center: 23rd June 2016 for mid night. RAS Online Form Submission will end on date: Last date: 25th June 2016 till mid night. RAS Pre Exam Date: Expected to hold in 28th August 2016. RAS Mains Exam: Expected to hold in October 2016. Make Correction in Application form start date: 26th June 2016. Last date for make correction in Application form: 25th July 2016. RAS Recruitment 2016 Eligible candidates can apply on the official website before last date of RPSC. RPSC RAS Online form will be commenced from 10th May 2016 to 25th June 2016. 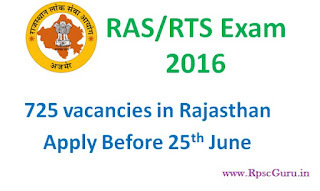 The official website to online apply for RAS exam 2016 is rpsconline.rajasthan.gov.in Candidates can apply till the last date of application submission. Download RAS Recruitment 2016 notification and check it carefully. An Online application form will be appeared on screen on website. Fill all the required mandatory details in RAS/RTS application form. Fill your active/valid email and mobile no. Photo and sign should be in required image format and size properties. A Unique online application id will be generated. Download and take a print of filled application form for future use. RPSC RAS/RTS 2016 Exam Admit Card will be downloaded soon before 15-20 days of examination by the enrolled candidates or who had submitted application form before the closing date. Via official site of RPSC, eligible contestant can generate the hall ticket of RAS Exam 2016. RpscGuru Team adversed to readers for stay connected with us we have give you all update on same time.